Thank you to those eagle-eyed members who have contacted us to highlight an error on the new programme card enclosed with your latest mailing. East Surrey College (Gatton Point, London Road, Redhill, Surrey RH1 2JX) / Reigate School of Art have just informed us of their part-time Heraldic Art Calligraphy and Illumination classes which will be running from September 2018. Concessionary fees may be available. Check out their website www.esc.ac.uk and search under Leisure courses for more information. We have some hard copy Part-time brochures - contact the Secretary if you would like one sent to you. The Society is saddened to hear of the passing of long-standing member John Allen. John's Memorial Service will be taking place on Friday 20th July at St Andrew's Church, Sonning, near Reading, Berkshire at 2pm. A tribute will appear in the next Gazette. We've only been up and running a week and already 100+ followers. Keep it up. There is a link to the Twitter and Facebook pages on our website, just click on the respective icon. The Summer Reception took place on Wednesday 6th June at Armoury House, the Headquarters of the Honourable Artillery Company. During the evening we launched our new publication, The Heraldic Art of John Ferguson. 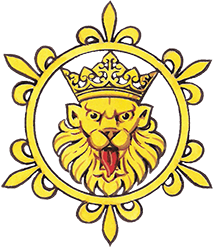 Contents of the Coat of Arms from 2005 can now be seen on this site. Linked pdfs are going to made available. Watch this space!